VIR is affiliated to the Vydehi Hospital in Bangalore which is one of India’s largest super specialty hospitals with a capacity of 1600 beds. Using a unique approach to charity 30% of the beds in all departments of the hospital have been reserved for the needy and free medical services are provided. Also VIR provides free transport pick-up and drop to all its patients irrespective of the distance. Using the latest technology in medicine and surgery, Vydehi Hospital offers international standards of clinical competence and research. This department work closely with each other. Their primary aim is to help patients and caregivers cope with illness. For this, a detailed psycho-social and economic assessment of each patient and caregiver is made to determine the specific need of the patient. Further, steps are taken to improve the quality of life of patients and their families facing the problems associated with live-threatening illnesses. This is done through the prevention and relief of suffering by means of early identification and assessment. It also includes treatment of pain and other problems physical, psychosocial and spiritual. These departments work closely with terminally ill patients and provide free services to all who approach them. Patients can approach VIR directly or as reference from other medical departments and institutions. The special Education centre offers a range of educational services for individuals with learning disabilities. This involves teaching techniques, exercises and subject matter specially designed by experts. Besides learning, the therapy involves physical therapy, counseling, modified learning environments, assistive learning devices. Psychological assessments and behavioral modification techniques depending on special needs of the students. After the disabilities and individual needs are established, the teacher develops individualized Educational Programme (IEP) with inputs from parents and the interdisciplinary team working with the child. The IEP includes current performance, education goals and objectives and methods to tackle emotional and behavioural issues. The complexity of the programme differs from child to child. 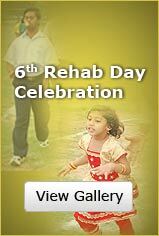 The Vydehi Institute of Rehabilitation (VIR) sensitively addresses the needs of people with physical or mental disabilities and those requiring post-operative care. Using a holistic approach, VIR also provides counseling as well as access to support groups to caregivers. A special centre for those in need of special care. A place to Revive, Rehabilitate, Reach and Rebuild. VIR has collaborated with the California State University, Los Angeles (CSULA) to improve and update its facilities. The university has also trained therapists at VIR in all areas of rehabilitation for the disabled.